Reeds Bay Apartment is a luxury four-bedroom condominium. Reeds Bay Apartment is a luxury four-bedroom condominium, that offers stunning views from both levels and most rooms with direct access to the white sands of Reeds Beach and overlook the Platinum Coast. Within this exciting apartment you and your guests will discover that all the bedrooms are air-conditioned and there is a spa pool located on the ground floor. Entering Reeds Bay Apartment, you are immediately greeted by a fully equipped kitchen that merges into the living area, which extends to a terrace with stunning views. This outdoor area has a covered patio and outdoor dining amenities, a barbecue and a private plunge pool. On the other side of the garden and lawn area, guests can roam straight onto the beach and take in romantic views of the Caribbean Sea. This may be an ideal choice for one of your sets of couples to stay, as the Master bedroom is on this floor. This bedroom has a king bedroom, is en-suite bathroom and is fully air conditioned. From the Apartment's second floor you will find two twin bedrooms, both with en-suite bathrooms. However, the most striking feature about this floor is the terrace area. Again, you and your guests are welcomed to dine here whilst either watching a sublime sunrise or phenomenal sunset. If you make the final ascent, you will find the last floor. At the top of this apartment complex is the final bedroom; which has a king bed and en-suite bathroom that includes a Jacuzzi bath tub. The third floor is ideal for a couple who might want an added level of privacy, as there is another fully equipped kitchen and dining & living area. On this floor, you will also discover access to the roof terrace that has a private swimming pool and an area where you and friends could relax in…an unexpected treat for sure! 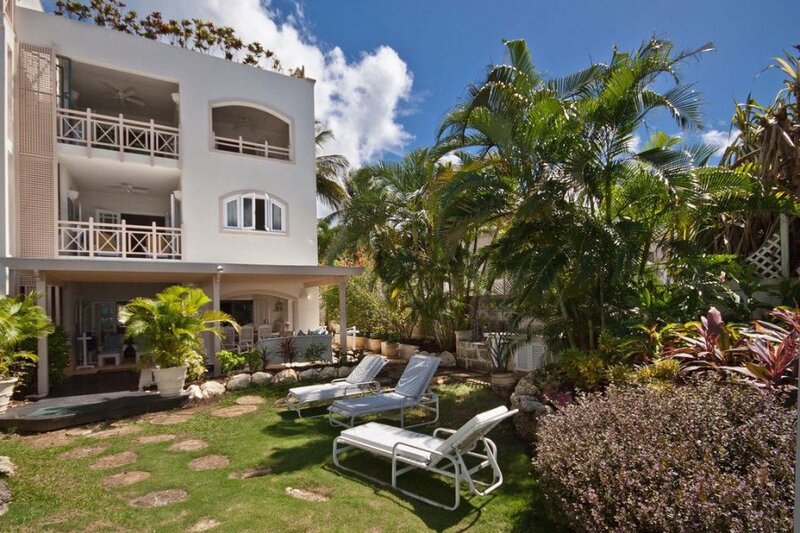 Reeds Bay Apartment is conveniently located equidistant between the excellent shopping and restaurants of Holetown and the charming and authentic second city of Speighstown so there is never a dull moment. Please Note - The Penthouse is only open and available for bookings of eight guests and therefore won't be accessible for bookings made for six guests. Reeds Bay Apartment is a 3-storey apartment type villa that has a 4-bedrooms and a private swimming pool on the roof terrace. With so much to offer and more, an exclusive beachfront apartment is the perfect base from which you can explore this delightful island. They are ideal for those who love to spend their days relaxing by the sea or taking part in a multitude of water sports which include snorkelling and scuba diving around the expansive off-shore coral reefs.